Write the error message to a stream. Indicate that this exception has been taken care of. Add info to the exception message. Set the severity for the exception. If this flag is set, all abortnow and maybeabort severities will be treated as runerror. Stream to write the error message to. True if this exception has been taken care of. The default stream to write the error message if unhandled. 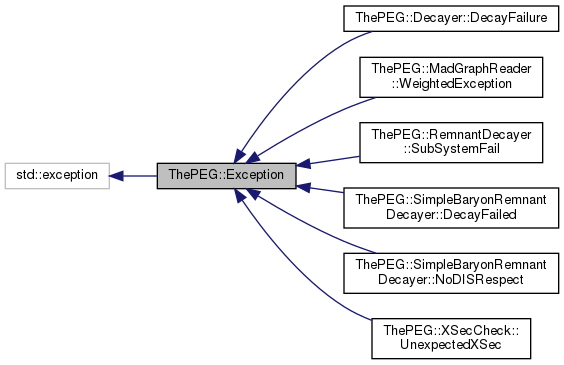 Exception is the base class for all exceptions to be used in ThePEG. It is derived from std::exception and adds information about the severity of the exception to indicate to the Repository and EventGenrator how to act on it. To throw an exception one should inherit from Exception and add information in the constructor of the base class. Alternatively one can use the operator<< operator on a default constructed Exception to add information as for a standard ostream object, in which case one should always end with adding an enum of the type Exception::Severity to indicate the severity of the exception e.g. Exception() << "Something went wrong." << Exception::eventerror. Definition at line 44 of file Exception.h. Not severe (but the user should be informed). Possibly severe, (the user should be warned). Command failed during setup phase, execution is continued. Possibly severe, (the event being generated should be discarded). Severe error, (the run should be terminated). Severe error, (the run should be terminated, possibly dumping core). Severe error, (the run is aborted immediately, before the exception is thrown). Definition at line 51 of file Exception.h. If equal compare error message lexicographically.